Mama's Random Fluff n' Stuff: Off the Hook! My friend recently saw my daughter's owl hat and asked me to make her an earflap hat, and a matching pair of mittens. Using the knowledge that I gained making my daughter's hat, I adapted an adult earflap pattern! Then we scoured Etsy for a great mitten pattern. I love how they came out! But I think they look much better in action! We went to the park to test them out. They were warm and comfy. Yay! 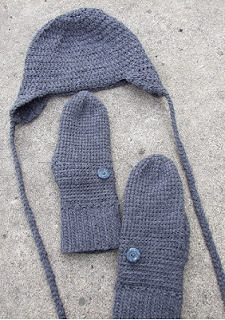 The pattern I used for the mittens is Ladies Wool Mittens from knot sew cute design shop. She has lots of great patterns, including these adorable little Felted Baby Button Boots! She was also so quick to help me out when I had a question. Thank you Kim for helping me make my first pair of mittens!